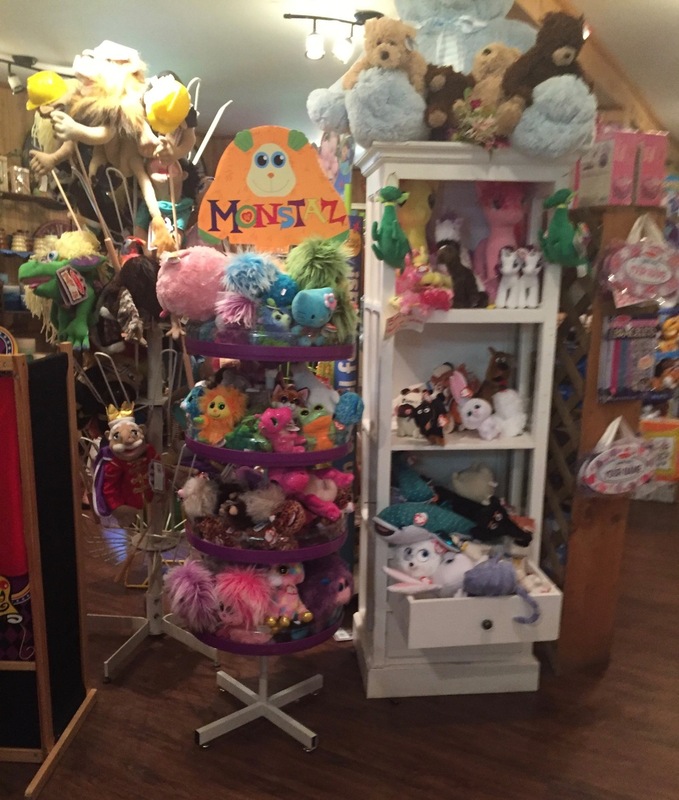 If you've got little kids in the Catskills, you've got to take them to Windham's Catskill Mountain Country Store. From the outside, it looks like a garden supply shop. But inside, it's a cozy restaurant, a shop selling lots of souvenir-ready locally made goods, and a surprisingly well-stocked toy store. And the best part is the trail behind the restaurant, leading to friendly animals and a lush waterfall, like something out of a storybook. And here's a look at their store, complete with local honey, maple syrup, hot sauce and salsa, plus a big selection of tea. 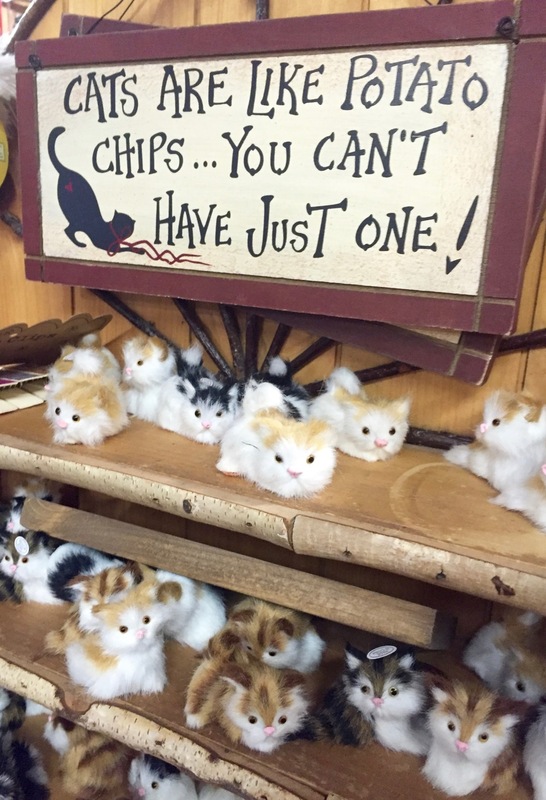 They've got plenty of knickknacks, including kittens clad in soft rabbit fur and a toy store stocked with books, stuffed animals and a ton of Melissa & Doug stuff. That cat sign is totally correct, by the way. Ramona bought two! 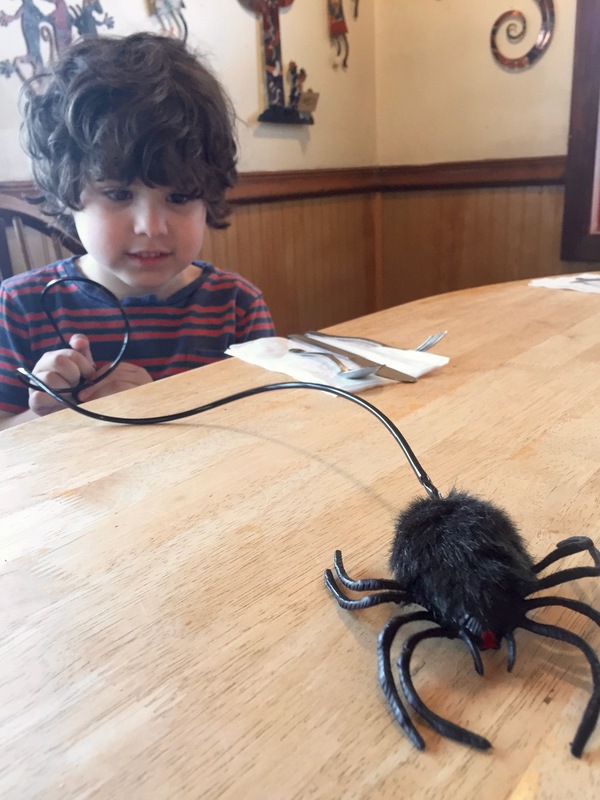 Archie got one of those hairy spiders with an air pump to make it jump. Our server pretended to be startled by it, to his delight. They have those little peg games, just like Cracker Barrel, but this is a mom & pop shop with a menu of fresh, made-to-order fare. My house-made buckwheat veggie burger was piled with mozzarella cheese and sauteed mushrooms, served with plenty of juicy tomatoes and fresh lettuce, crunchy chips and a tangy-sweet chunky salsa. There are a couple of signs on the front door advertising a barn yard and warning about garden trolls. To be honest, with all the tchotchkes around, I figured they were pointing us toward a bunch of gnomes and garden figurines for sale in the backyard. I had no idea we were headed on a storybook adventure. Archer and Ramona, holding my parents' hands, followed the signs up some beautiful stone steps. We didn't see any trolls on the bridge, but it really looked like the sort of bridge where you just might see a troll (or fairy or leprechaun) scampering into the shadows. Into the woods and around a bend, we walked right into a couple of horses and goats -- real animals! not garden statues! -- snacking on hay. Ramona, a serious horse-lover, looked like she might explode with glee. Next, we followed the trail to a dark little shack that was home to some bunnies. We followed the narrow trail farther into this enchanted-looking forest to find a babbling brook and a trickling waterfall. Next time we'll all wear our sneakers. On the way out, there was a little pond and a small playground, but we were distracted by this teeny tiny toad, which is the closest we came to discovering a magical creature. This is Archer's little 5-year-old hand below, and the toad was about the size of his thumbnail. Even though I'd captured lots of pretty pictures already, I was glad when Ramona saw the sign below and and said, "I need to put my face in that." And you gotta love this giant chair. 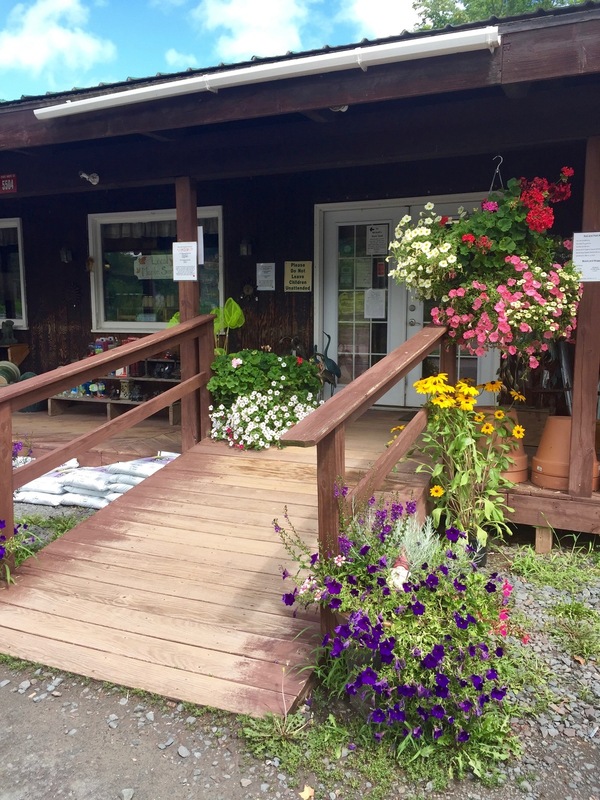 The Catskill Mountain Country Store is open for breakfast and lunch and has locations in Windham and Tannersville. For more information, check out their website. Aug 9 Superior Sweets at Windham's Higher Grounds Coffee Co.